Looking to create a blog? WordPress is a website Content Management System (CMS) written in PHP that drives what a blog looks like, how users interact with it, and what you do with that blog. It is the most popular CMS out there for bloggers. When you decide to create your own blog, you can either download the software from WordPress.org and host the blog on your servers or create a blog on WordPress.com and not have to worry about software or server maintenance. The beauty of WordPress is its extensibility. To add a custom feature to a WordPress site, you incorporate something called a plugin. First released in 2003, WordPress has had over 10 years’ worth of custom plugins created, resulting in over 46,000 ways to make your blog unique. WordPress is the most popular CMS out there for blogging. It offers over 46,000 plugins to enhance the basic system software. Here we take a look at the 10 most popular plugins of all time. Akismet is your forum spam protector. Nobody likes spam email. With blogs, you have to worry about “spammy” comments, and it is the handling of those comments where Akismet shines. The plugin is multilingual (44 at last count) and reveals misleading URLs as one of its significant features. The tool will show how frequently users comment and automatically delete comments or place them into a moderation bucket. The plugin is so popular that some other plugins are built on top if it to extend Akismet’s features. The All in One SEO Pack plugin is the first of several SEO-related plugins in the top 10. They all do their best to optimize your site for search engines like Google. The big added feature of the All in One SEO Pack plugin is that it provides an API so other plugins can extend it. It is the only SEO plugin that integrates well with WordPress e-commerce sites. They offer Google analytics and sitemap support. It tries its best to be accessible to both beginners and advanced users. Most websites need a contact form. Contact Form 7 is the most popular plugin for WordPress for just this purpose. It is multilingual, provides CAPTCHAs and offers anti-spam support. If you’re not familiar with sitemaps, they are an XML formatted file you reference in the robots.txt file that allows a search engine to better index your website. The Google XML Sitemaps plugin does this single SEO task of automatically maintaining the file for you, and not just for Google. It also communicates with Bing, Yahoo, and Ask.com. The plugin author prides himself for having supported it for more than nine years. A blog can be like someone talking to themselves if there are no visitors. WordPress SEO by Yoast helps get your site ranked more highly and thus brings in more eyeballs. Like Google XML Sitemaps, the plugin maintains your XML sitemaps and automatically submits them to Google and Bing. But, it doesn’t stop there. It does page analysis to make sure you don’t forget elements search engines need to rank pages highly. It optimizes multipage content so that all pages are indexed but only the first page shows in the search results. The list of features goes on for a while. If you happen to have started your blog on WordPress.com before moving to your own server, there were several features they offered that enhanced your blog. The Jetpack by WordPress.com plugin brings many of those features to the non-WordPress.com blogger. The features include some social media integration, posting to your blog from email, and a spell, style, and grammar checker, among a ragtag fleet of additional options. You don’t have to have started on WordPress.com to use the plugin, but if you didn’t, you’ll need to wade through all the options to better grasp the long list of features available. Quite simply, NextGEN Gallery is an impressive engine for managing galleries of images. It lets you autoscale your images to a maximum size, upload straight from ZIP files, and upload via FTP instead of via a webform. You can also configure the image quality so images load faster, helping SEO. The plugin lets you configure galleries to be thumbnail-based or slideshow-based, set the page size, and be AJAX-based to avoid page reloads. The list of features goes on and on. As the name might imply, the W3 Total Cache plugin optimizes your blog by caching pages. It converts the dynamic pages generated via PHP scripts into static HTML files. When a page is requested, instead of having to run the heavy-handed PHP scripts to dynamically generate the page on the fly, it will return the stored static pages. Once dynamic content is added by a user, like page comments, it stops. If you ever have to deal with spikes in traffic, this works great to let your server handle the added demand. The Google Analytics for WordPress plugin isn’t necessary to use Google Analytics for tracking with WordPress but will enhance the experience by providing additional meta data to the tracker. It does this primarily by allowing you to automatically include custom variables in the tracking, all to provide better reports when viewing the tracking reports from the Google Analytics site. It also offers to track outbound links so you know where people go when they leave your blog. When using WordPress, it is important to keep your site up-to-date to ensure the most secure site. While updates typically add new features, more often than not, in the Web world we live in, those updates also include security enhancements to counter new tricks from hackers trying to steal user information. It is important to watch for updates for all the plugins you are using and the main WordPress system software. While there are more than 46,000 WordPress plugins available, try not to overdo it when adding them to your server. Each one you add consumes more system resources and slows down your site. It may not be much for each, but each little bit adds up. Tread carefully and start slowly without trying to add everything at once. While groupthink discourages creativity, it does offer a great way to get started when blogging. 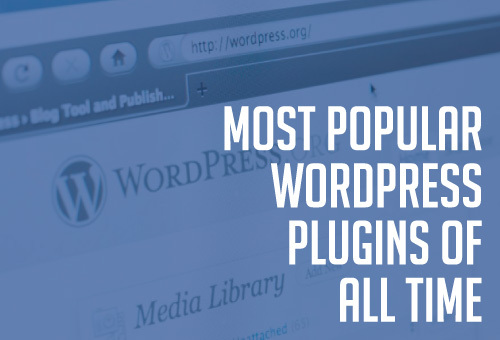 The shear number of plugins available for WordPress can overwhelm the average user. By looking at the most frequently downloaded plugins, you can enhance your website with the most popular ways others already have without digging through 46,000 descriptions. Then, once things are rolling more smoothly, you can branch out and see what else is out there.